Bethesda's consistency became a thing of legend with Fallout 76, where they consistently proved the game was a lazy cash grab. This extended to the $200 Power Armor Edition where buyers got a bag made of cheaper materials than advertised. One would think that when you shell out $200 for a specific edition of a game, you would get what was advertised. Well, that's wrong in Fallout 76's Power Armor Edition, since Bethesda found the canvas duffel bags to be too expensive and shipped cheap nylon ones instead. Several buyers of this edition sent complaints to Bethesda. 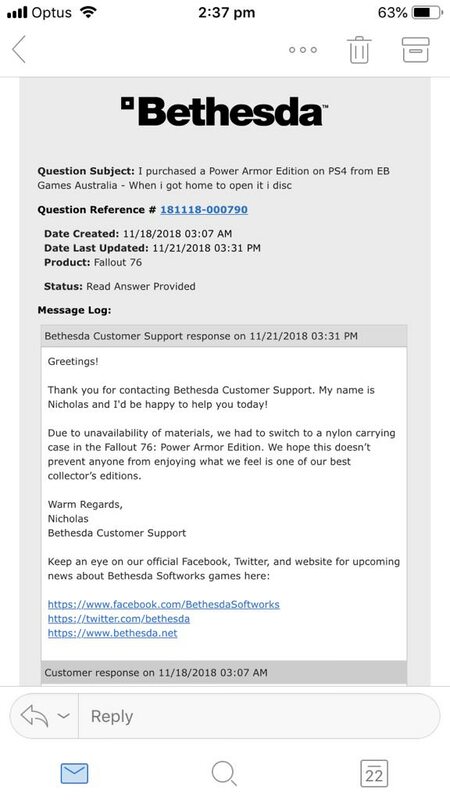 One official answer stated that the company hopes that the material change doesn't prevent enjoying the product for anyone as Bethesda's staff feel like this is one of the best collector's editions they made. Another answer was way shorter and more concise, merely stating that the bag shown on the advertising material was simply a prototype and too expensive to make. The same employee also noted that the company doesn't plan to do anything about it. This means no refunds and no compensation. A Redditor named AlexanderDLarge posted a thread with a compilation of these complaints, along with a pastebin version of the mail stating that Bethesda has no intentions of making good to Power Armor Edition buyers. 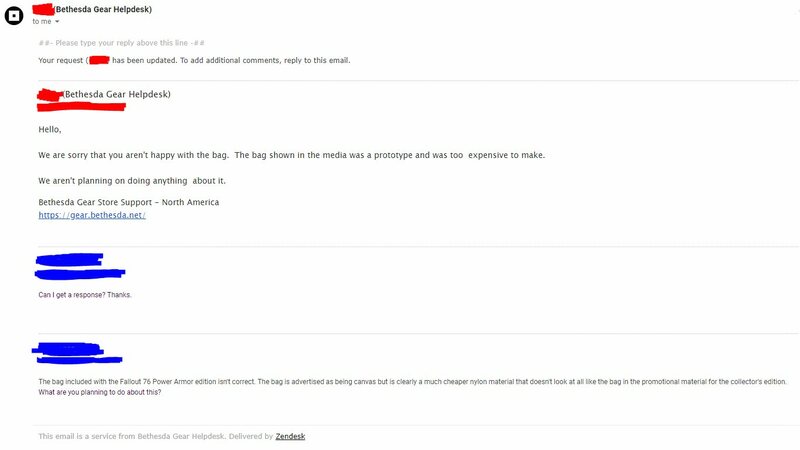 Several other Reddit users mentioned that this could be enough material for taking Bethesda to court, but a better solution would be issuing a chargeback as credit card companies would have enough materials to justify it, thanks to the provided emails, Bethesda's promotional video and screenshots that stated the bag would be made of canvas, and not nylon. At some point, the official website changed the description in the text portion, which now states the bag is indeed made of nylon, but the suspiciously low-resolution screenshots still say it's made of canvas. Same goes for the trailer embedded above. Some Redditors in the thread used this opportunity to jest about the general state of Fallout 76, quoting the "prototype that was expensive to make" response and saying it sounds like the game overall.